Thor: Ragnarok (2017), (♦♦♦♦½): Thor has saved earth twice by now and has, for the last two years, wandered the universe searching for infinity stones. He hasn't found any. He has, however, become prisoner of an enemy of Asgard, Surtur, who tells Thor that his visions of Asgard engulfed in flames is a premonition of Ragnarok—the destruction of Asgard, which is already in motion. Thor frees himself and arrives at home to find Loki sitting on the throne, passing as Odin, and neglecting his duties to protect the Nine Realms. With Odin's exile, Asgard's enemies have been reassembling, but Odin's death may just free Hela, a goddess against whom neither Thor nor Loki are enough. It was in Thor: The Dark World where Loki, an antagonist, first threatened to steal the show. He became the villain that Marvel fandom loves to hate. While Loki is at his most charming in this film, the director, with the help of a sparkling screenplay, has very much exploited the great chemistry of the whole ensemble, including the excellent dynamics between Chris Hemsworth as Thor and Tom Hiddleston as Loki. Cate Blanchet as Hela, Norse goddess of Death, is one heck of an actress portraying one heck of a villain, to be admired even more because she is Marvel's first female villain. She is a wonderful and sassy addition to Odin's family of misfits. Some old characters of the franchise reprise their roles, such as Idris Elba as Heimdall, and Anthony Hopkins as Odin. There are also wonderful additions to the cast such as extended cameos by Benedict Cumberbatch as Dr. 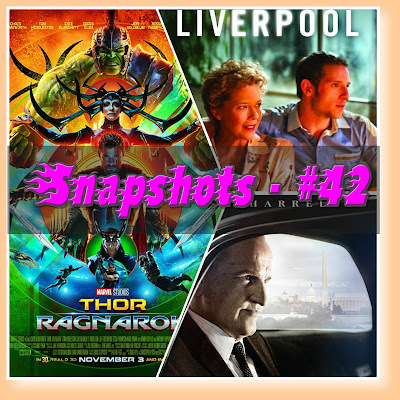 Strange and Jeff Goldblum—in a vibrant performance as The Grandmaster—, and the wonderful complementary performances of Tessa Thompson as Valkyrie and Mark Ruffalo, in a more active supporting role as Bruce Banner/The Hulk. This third and final installment of Thor remains as aesthetically beautiful as its predecessors, but it is also immensely more entertaining. They haven't taken themselves too seriously, and the movie is much better for it. 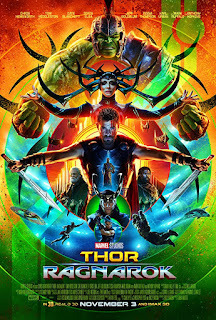 They have humbled Thor by making fun of him and however dark this film is, it is very much a fun fest. Film Stars Don't Die in Liverpool (2017), (♦♦♦♦): film actress of the 1950s, Gloria Grahaeme (Annette Bening), is working in Liverpool as a theater actress in 1979. She meets young actor Peter Turner (Jamie Bell), and what begins as an invitation to drink and dance, heats up into a passionate love affair. As the romance becomes serious, Gloria values Peter's support, but their love will be tested in ways they could not have foreseen. I was expecting an average movie before I started watching Film Stars Don't Die in Liverpool, maybe that's the reason why I waited almost a month to see it. What I got in this outstanding drama, about an unconventional love affair, was one of the most understated and under the radar gems of 2017. It has the vivacity of Being Julia (also about an aging theater actress) at the peak of the affair but ends up with a punch in the gut that you won't see coming. You'll likely need a recovery anything to shake the emotions this movie might stir in you, at least I did. 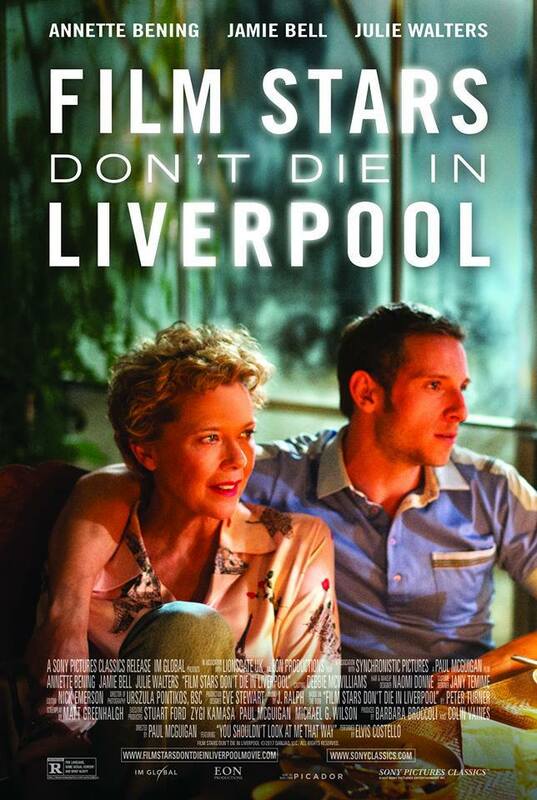 Film Stars Don't Die in Liverpool is pure artistry from beginning to end, from scenes in which Peter watches through a window or a lighted hall to evoke a memory, to the opening or closing of doors to snap out of it. The film takes place more or less in two timeframes: 1979 and 1981, using flashbacks often and switching both characters' perspectives to tell the story. The result is a smooth narrative with lively music and two of the most notable performances, not just of 2017 but, of any given year. I think I have seen Jamie Bell in just two movies: as a child actor in Billy Elliot, and in The Eagle, a fairly average adventure opposite Channing Tatum. From watching those movies, I wouldn't have guessed he was able to portray and convey that range of emotions. It isn't easy for any actor to keep up with Annette Bening in top form, yet he did it seemingly effortlessly. Watch this film for the artistry, for the career defining roles, and for the roller coaster of emotions that come with watching great filmmaking. LBJ (2017), (♦♦♦): Being up to that point the U.S. Senate Majority Leader, Lyndon Baines Johnson announced his intention to run for President in 1960. John F. Kennedy won the nomination of the Democratic Party, and asked, against his brother's counsel, Lyndon Johnson to be his running mate. They won by a narrow margin against Richard Nixon, and JFK immediately threw himself into the task of putting before Congress the Civil Rights Bill, one of his major campaign promises. As Bobby Kennedy was a powerful influence in his brother's administration and didn't see eye to eye with Lyndon Johnson, the latter was increasingly relegated to the vastly thankless job of Vice President, until the events in Dallas altered the course of Kennedy's Presidency and the country's. Within the library of presidential biopics, LBJ is just an average one. It is well acted by Woody Harrelson as Johnson, but it is neither a career defining role nor a groundbreaking film. That being said, I think it succeeds in shining a favorable light into the inner life as well as the public persona of the man who led the nation during such tumultuous times, and gives a different perspective (not so favorable, in my opinion, of the Kennedy brothers in the White House). I wasn't a fan of the multiple switches of years and settings at the beginning of the story; it was dizzying and confusing, but once the story passed the events in Dallas, it became a linear narrative to the end. That—despite having strong opposition in Congress— Lyndon Johnson was able to sign the Civil Rights Act into law and thus able to cement a legacy for his presidency as well as for his predecessor's, is commendable. The movie makes a strong case on that point, as does on Lyndon Johnson's apparent lack of conviction on the rights that people of color should have had before the law. LBJ implies that Lyndon Johnson favored the Civil Rights Bill out of practical concerns and less out of political fervor. I do not know if that depiction is accurate, but based on his opinions in the movie, it's a plausible scenario. I know nothing about Lyndon Johnson's life and political career, thus I would like to read his biography by Doris Kearns Goodwin. Hopefully it provides a balanced view of the man and his times. While LBJ is not a powerful cinematic experience by any means, it’ll give a view into the man and his times that may be enlightening to some, at least that was the case for me. Thor just sounds like a hoot and I really like all the actors in it that you named, but I gather I need to start at the beginning of the trilogy. And I agree with you about Annette Bening - wonderful actress! As for LBJ, I am old enough to remember that era and I really don't feel any need to relive it through a movie. Even one with Woody Harrelson. 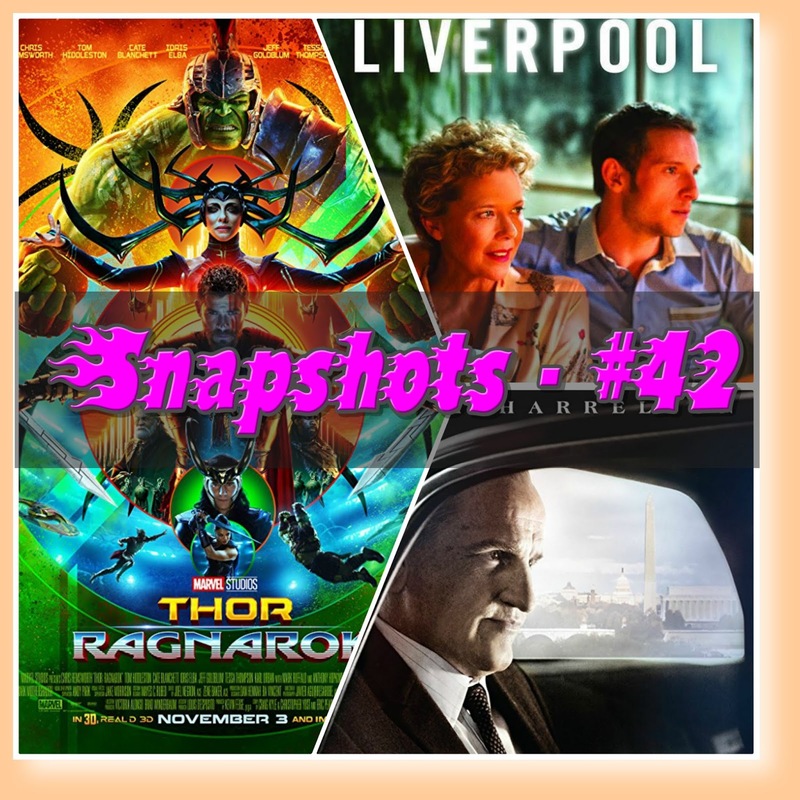 The Thor movies are not my kind of thing, but I will for sure check out Film Stars Don't Die in Liverpool. 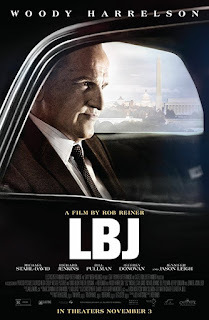 The next book of the LBJ biography series I have been reading will cover the same ground as the movie, so I will save that for later after I have read the book. We finally saw The Darkest Hour and it was good. Next up is Mark Felt. And I saw I, Tonya on the plane as I was flying home on Tuesday. I thought it was great! By the way, I just read your comments on Dorothy's blog about C J Box, etc. Which Eastern European country did you come from? Film Stars...is outstanding. I hope you agree and like it as I did. Let me know once you read the next book in the biography of Johnson, after you've watched the movie, if you agree with their portrayal. I am interested in knowing what you think. In fact, that's about the only reason why I reviewed an otherwise uninteresting movie. I have The Darkest Hour on my queue. I'm glad you liked it. I hope you like Mark Felt as I did and find it food for thought. I also have I, Tonya on my queue. I'll be watching Lady Bird and the musical first. I'm not from Eastern Europe, but socialism in my country was modeled after the former Soviet Union and its satellites. They were perversely the same in their own unique ways. Thanks for the tip on the Annette Bening movie: will get to it! Somehow I didn't see Being Julia (I just now watched the trailer for it) but it seems to have some things in common with this newer movie of hers. How interesting. Jennifer Jason Leigh as Lady Bird seems to be a bit wild for LBJ. Too bad it wasn't as good as perhaps it could've been -- with all that material. Nice roundup. Being Julia is Bening at her very best. Film Stars... is perhaps second best. I hope you enjoy it. Let me know what you think once you watch it. Yes, both movies are about a theater actress dating a younger man, and they are bubbly, but the comparisons stop there. Jennifer Jason Leigh was good in that role. Not the kooky type she always portrays, and not that prominent a role but I thought she was well suited for it. I was surprised the movie wasn't better as there was early Oscar buzz for Woody Harrelson for this movie. I think he is good but not extraordinary. Other presidential biopics have been much better: Lincoln, Truman, Nixon and W come to mind.